The distinctive foot, with plinth base, on this chest-of-drawers was used by Thomas Chippendale on a secretaire-bookcase supplied to Sir Lawrence Dundas, Bt. in 1764 and on a secretaire-cabinet supplied for Paxton House, Berwickshire circa 1775 (C. Gilbert, The Life and Work of Thomas Chippendale, vol. II, figs. 87 and 91). His design for a 'Desk & Bookcase' (pl. 112) in The Gentleman and Cabinet-Maker's Director, 1762 has a foot of similar form, carved with foliage and rockwork. 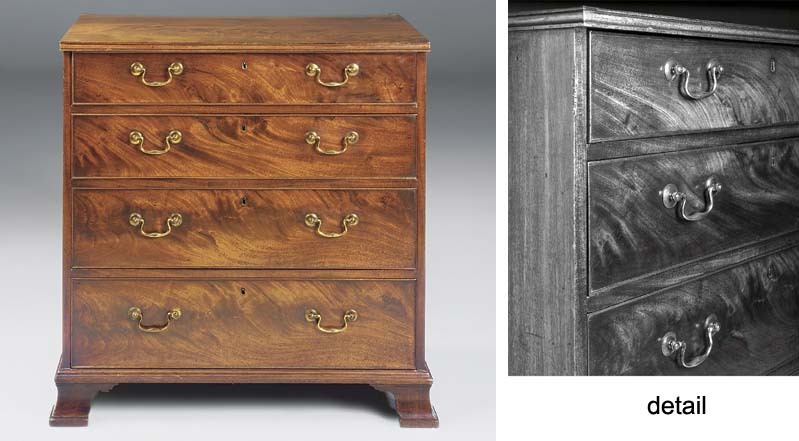 The construction of the tops of the drawer wells to enable the drawers to run smoothly, is also a characteristic of Chippendale.